Cumbernauld Environmental Society are delighted to announce that the first stage of preparation for the proposed Cumbernauld Community Memorial Peace Garden has completed. North Lanarkshire Council have confirmed that an area of derelict land in Greenfaulds, located next to Greenfaulds Bowling Club, can be used for the project. 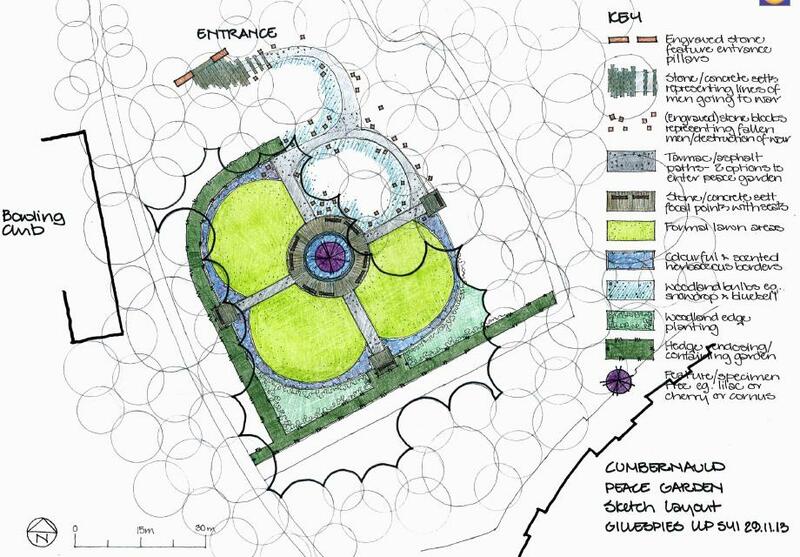 A draft sketch, showing how the finished Cumbernauld Community Memorial Peace Garden may look, has also been prepared by, the world renowned, Gillespies Landscape Architects, who have a wealth of experience in developing similar projects. The development aims to create a pleasant environment for quiet reflection, in commemoration of all those from Cumbernauld who have lost their lives in service of their country between 1914 and the present day. It is hoped that much of the practical work for the garden can be completed in time to commemorate the centenary of the beginning of the First World War on July 28th. A number of sites throughout Cumbernauld were reviewed for suitability and the Greenfaulds location was deemed to be the most ideal. The former Greenfaulds Orchard site offers a reasonably sized area of vacant land, with a south-facing environment, good accessibility from public transport, and an existing car park, as well as being within reasonable walking distance for a large number of local people. The draft plans have been put together following a number of public meetings and positive discussions with key stakeholders including local Councillors from both political parties. The project is being developed by a working group of local organisations including Cumbernauld Air Cadets, Cumbernauld Army Cadet Force, Cumbernauld Rotary Club, the Cumbernauld branch of the Royal British Legion, and Cumbernauld Environmental Society. Adam Smith, Vice-Chair of Cumbernauld Environmental Society, said “This is a fantastic project and we’re delighted to see it progress to the next stage. With so many local organisations working together, and with plans to involve all local schools in the development, this is hopefully one project which will serve to further strengthen community links and civic pride throughout the town”. The next step will involve finalising the planning and development stages of the project, working to secure the required funding and preparing a completed design before capital works can commence. The draft plans will be presented to attendees of the upcoming Cumbernauld Community Forum meeting which will take place in Cumbernauld College at 7pm on Tuesday 14th January. All are welcome to attend the meeting.